AN EASY BIKE TOUR IN PUGLIA, ONE OF THE RICHEST PLACES IN THE WORLD FOR THE VARIETY OF ITS BACKGROUNDS, HILLY VILLAGES, FOOD AND TRADITION. 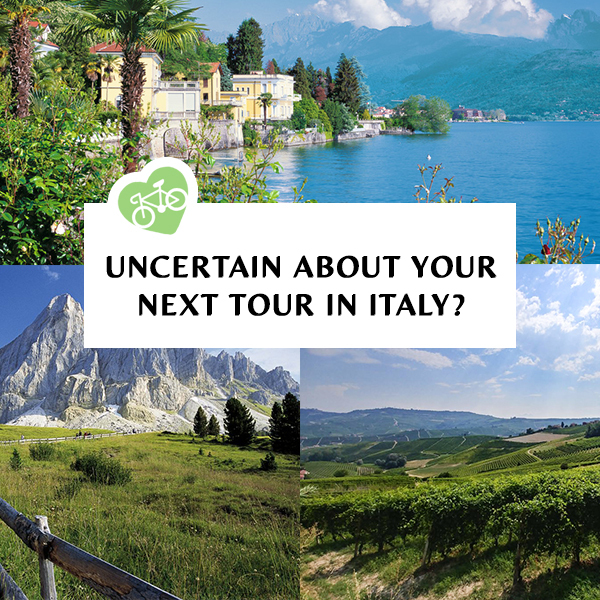 A really unusual Tour in this enchanting region in southern Italy. An easy bike tour in Puglia, one of the richest places in the world for the variety of itsv backgrounds, hilly villages, food and tradition. 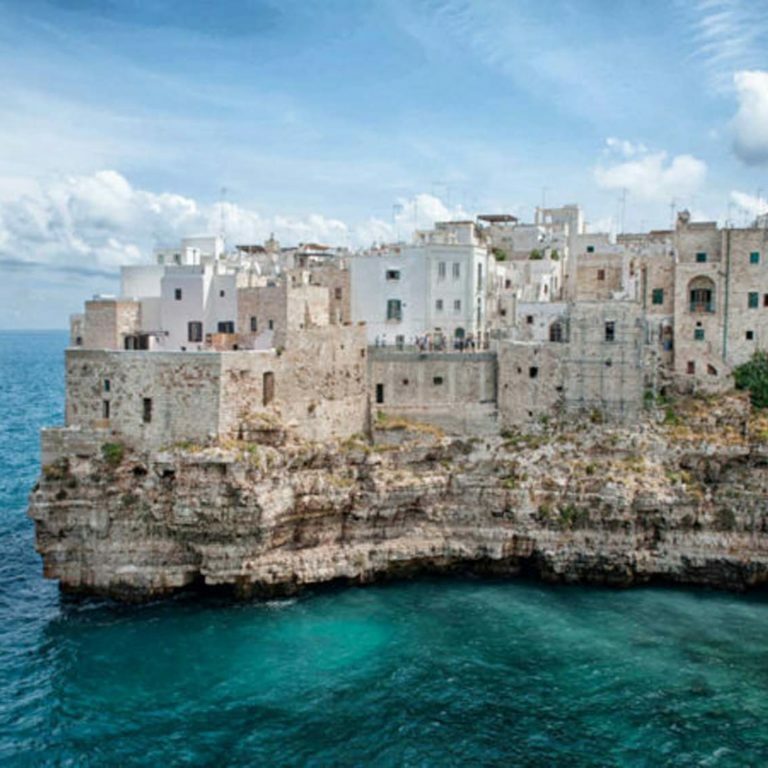 Kilometers of coastline are the setting for old olive groves, ravines, trulli, Saracen towers, old historic villages. With us you can slowly discover an area that has always been a crossroads of different cultures, and who better than a local bike- tourist guide can take you in this extraordinary bike tour in Pulglia? Here the nature is the protagonist, an burst of shapes, colors and flavors throughout the year, all the best that this extraordinary region has to offers and an exclusive , luxury accommodation. 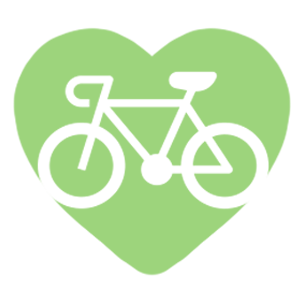 EXCLUDED: Beverages, lunchs, tips, medical Insurance, everything is not explicitly written in this page! EXTRAS: Single room option 300€, Rent of trek bike 150€, rent of ebike 280€. Transfer from airport/station to our accommodation. This route, 50 kilometers long, is certainly one of the most important itineraries of the Valle d’Itria: we will ride in nature among olive trees, trulli and wonderful landscape unique in the world. At the end of these roads we will get in the district of Monopoli, bounded by dry stone walls and Trulli, and from there we'll head to Locorotondo. 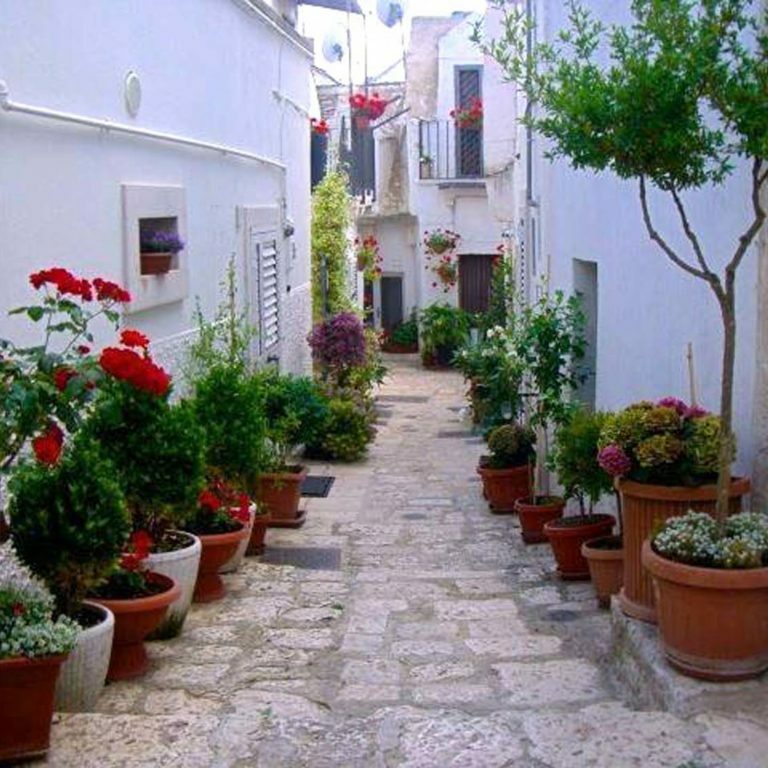 Locorotondo is a small town in the Valle d’Itria, between the Adriatic Sea and the Ionian Sea. Characterized by a breathtaking view, it is defined as one of the most beautiful villages in Italy, it owes its name to the particular rounded morphology of its populated center. It is pleasant to visit the historic center, take a coffee and enjoy the view. 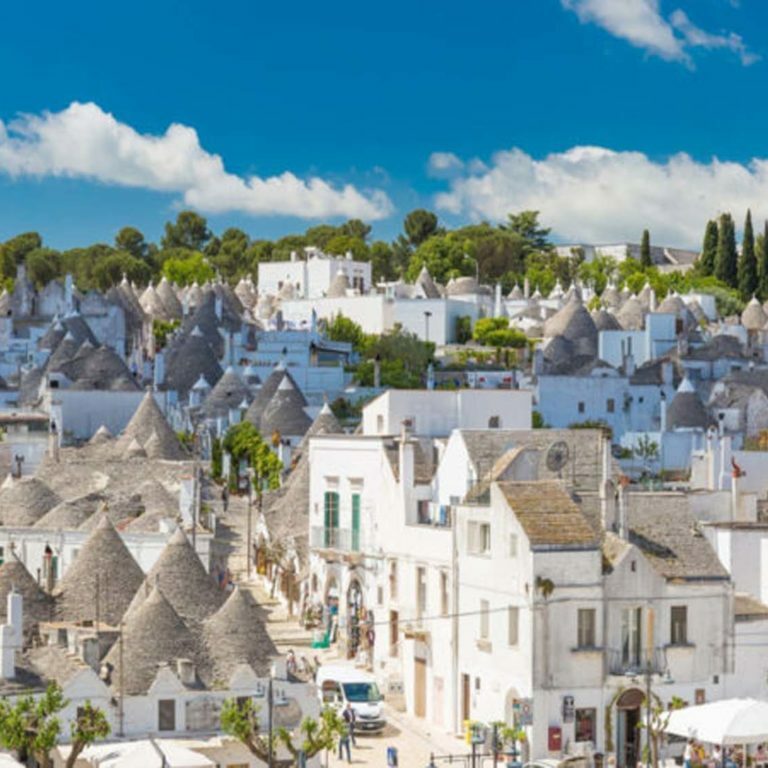 The next destination of the day we'll be Alberobello, “capital of the trulli and UNESCO world heritage”. 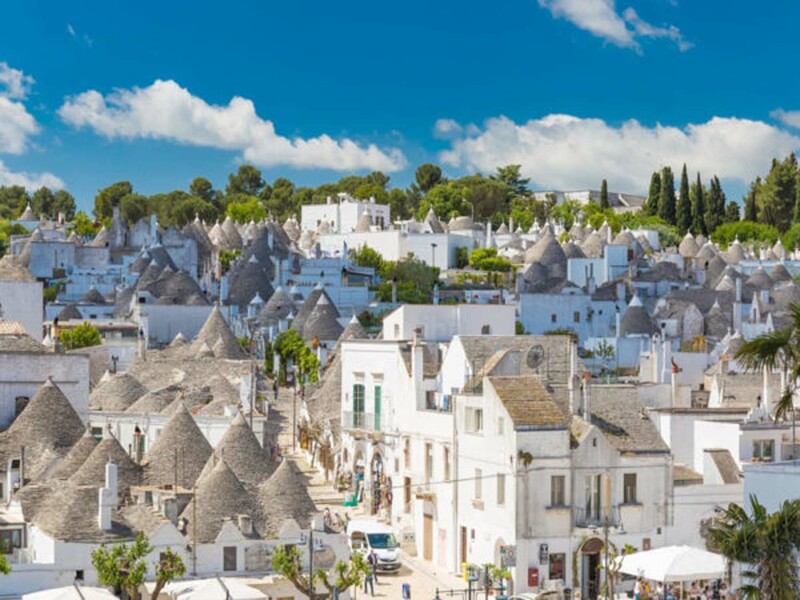 You will be astonished by the uniqueness of the houses of Alberobello: you will have the opportunity to visit the streets of the village, full of souvenir shops and restaurants where you can taste the local delicacies, allowing yourself a relaxing lunch break. After lunch we will cycle for about 25 kilometers along the districts of Valle d’Itria and then return to our accommodation where we'll close the first day of this unforgettable bike tour. Today we will lead you to the historic centers of Castellana Grotte and Conversano, and ends in the wonderful town of Polignano a Mare. Along quiet back roads, we will cycle towards Castellana Grotte for about 17 kilometers to get in the small historical square of the town. Afterwards, we will head to Conversano, an old agricultural center, built on a high ground of the southeastern Murge, famous above all for the production of excellent cherries. We will visit its historic center where we can admire the castle of Norman origin, the cathedral and the convent of San Benedetto. In the beautiful square we can also have a coffee break. 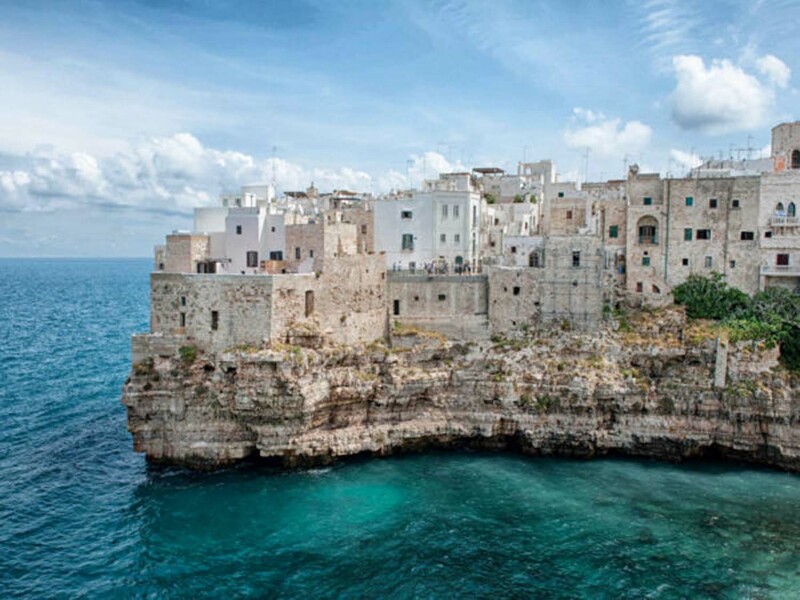 We will get back in the saddle and, after about 10 kilometers dealing with some rolling hills, we will arrive to the sea and visit one of the most fascinating points of Puglia, Polignano a Mare. Polignano a Mare is famous for the fans of the “Red Bull Cliff Diving World Series” and it is a village overlooking on the cliff. Once we enter the old city we can visit the typical narrow streets that lead to the characteristic panoramic balconies. Continuing along the coast, we will return to our accommodation. 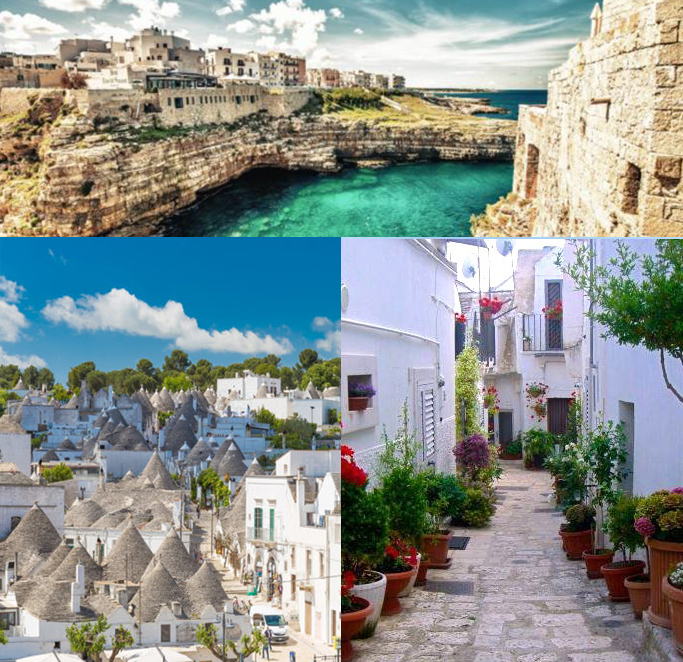 This itinerary, about 50 kilometers, will take us to the discovery of the typical colors and scents of Puglia, the Adriatic Sea will be the background. After a morning cycling of approximately 12 kilometers, we will get in the hamlet of Capitolo, a well known local bathing area. Biking further alongside the coast, we will head for the excavations of Egnazia, one of the most important archaeological sites of Puglia. After the break, in a few kilometers, we will arrive to Savelletri, known for its marina and for the presence of old buildings on the cliffs called the “White Houses”. Cycling along the coastline, we will arrive in Monopoli. We will go through the high perimeter walls to discover its fabulous architecture, until we reach the suggestive “Giuseppe Garibaldi” square, full of restaurant and bar where you can have a local snack. Another extraordinary cycling day is waiting for us for discovering the Puglian traditions and will be a also good opportunity to taste our dairy specialties. After riding along the “Panoramica” of Monopoli we will get into a network of historical villages and from there, after 20 kilometers, we'll arrive in Putignano. Putignano is known for its manufacturing companies and for karstic caves. Along the typical narrow stone streets we will have our daily morning coffee o "capuccino. Keep on riding for about 7 kilometers, crossing a historic stone bridge, we will get at the town of Noci that rises on the southern Murge hills. 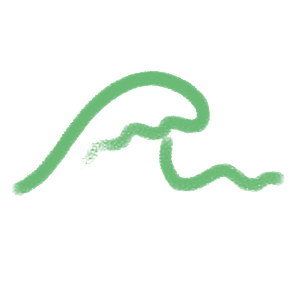 Noci is famous for its dairy products: burrata, mozzarella and ricotta, which you will be able to taste. At the end of the visit and the break, we will return to our accommodation. Today we'll ride on one of our most scenic routes. We will cycle across the green Apulian countryside to get in suggestive places: the famous Grotte di Castellana and the Grotta del Trullo, which guarantee a unique and exciting experience! Going through the locality “Antonelli”, we will continue for a few kilometers on a peaceful back road, and then go back into the dense network of the districts of Monopoli. After 20 kilometers through the scenic Puglian landscapes, we will get to the “Grotta del Trullo”. This cave of karstic origin and characterized by the formations of stalagmites and stalactites. Is the first cave in Puglia to be opened for to the public. Here, it is possible to visit the cave Standard tours take about 30 minutes. This route, 50 kilometers long, is certainly one of the most important itineraries of the Valle d’Itria: we will ride in nature among olive trees, trulli and wonderful landscape unique in the world. The first part of the day, characterized by a panorama of ancient olive trees, takes us to the town of Coreggia. Cycling along peaceful back roads, we'll enjoy a wonderful view between the intense blue of the sea and an expanse of olive trees that stwen from the coast to the hills of the Murgia. 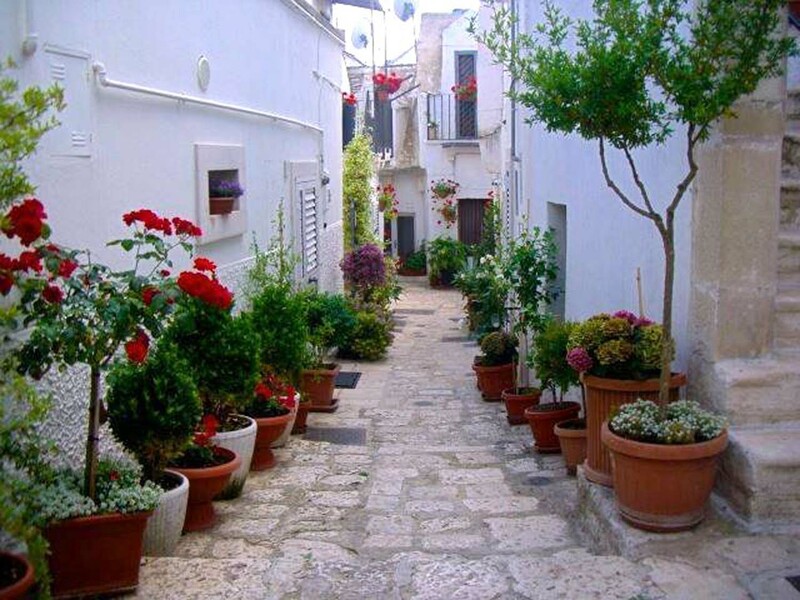 Locorotondo is a small town in the Valle d’Itria, between the Adriatic Sea and the Ionian Sea. Characterized by a breathtaking view, it is defined as one of the most beautiful villages in Italy, it owes its name to the particular rounded morphology of its populated center. It is pleasant to visit the historic center, take a coffee and enjoy the view. southeastern Murge, famous above all for the production of excellent cherries. We will visit its historic center where we can admire the castle of Norman origin, the cathedral and the convent of San Benedetto. In the beautiful square we can also have a coffee break. We will get back in the saddle and, after about 10 kilometers dealing with some rolling hills, we will arrive to the sea and visit one of the most fascinating points of Puglia, Polignano a Mare. After a morning cycling of approximately 12 kilometers, we will get in the hamlet of Capitolo, a well known local bathing area. Biking further alongside the coast, we will head for the excavations of Egnazia, one of the most important archaeological sites of Puglia. After the break, in a few kilometers, we will arrive to Savelletri, known for its marina and for the presence of old buildings on the cliffs called the “White Houses”. After riding along the “Panoramica” of Monopoli we will get into a network of historical villages and from there, after 20 kilometers, we'll arrive in Putignano. Putignano is known for its manufacturing companies and for karstic caves. Along the typical narrow stone streets we will have our daily morning coffee o "capuccino. Keep on riding for about 7 kilometers, crossing a historic stone bridge, we will get at the town of Noci that rises on the southern Murge hills. which guarantee a unique and exciting experience! Going through the locality “Antonelli”, we will continue for a few kilometers on a peaceful back road, and then go back into the dense network of the districts of Monopoli. After 20 kilometers through the scenic Puglian landscapes, we will get to the “Grotta del Trullo”. This cave of karstic origin and characterized by the formations of stalagmites and stalactites. Is the first cave in Puglia to be opened for to the public. Here, it is possible to visit the cave Standard tours take about 30 minutes.